The Christian Democratic Union of Germany (German: Christlich Demokratische Union Deutschlands, CDU; [ˈkʁɪstlɪç ˌdemoˈkʁaːtɪʃə uˈni̯oːn ˈdɔʏtʃlants]) is a Christian democratic and liberal-conservative political party in Germany. It is the major catch-all party of the centre-right in German politics. The CDU forms the CDU/CSU grouping, also known as the Union, in the Bundestag with its Bavarian counterpart the Christian Social Union in Bavaria (CSU). The leader of the CDU, Angela Merkel, is the current Chancellor of Germany. The CDU is a member of the Centrist Democrat International, International Democrat Union and European People's Party (EPP). Immediately following the collapse of the Nazi dictatorship at the end of World War II, the need for a new political order in Germany was paramount. Simultaneous yet unrelated meetings began occurring throughout Germany, each with the intention of planning a "Christian-democratic party". The "Christlich-Demokratische Union" was established in Berlin on 26 June 1945, and in Rheinland and Westfalen in September of the same year. The founding members of the CDU consisted primarily of former members of the Centre Party, German Democratic Party, German National People's Party, and German People's Party. Many of these individuals, including CDU-Berlin founder Andreas Hermes and future chancellor of Germany Konrad Adenauer, were imprisoned for the involvement in the German Resistance during the Nazi dictatorship. In the Cold War years, after World War II up to the 1960s, the CDU also attracted conservative, anti-Communist former Nazis and Nazi collaborators into its higher ranks (like Hans Globke and Theodor Oberländer). A prominent anti-Nazi member was theologian Eugen Gerstenmaier who became Acting Chairman of the Foreign Board (1949-1969). One of the lessons learned from the failure of the Weimar Republic was that disunity among the democratic parties ultimately allowed for the rise of the Nazi Party. It was therefore crucial to create a unified party of Christian Democrats – a Christian Democratic "Union". The result of these meetings was the establishment of an inter-confessional (Catholic and Protestant alike) party influenced heavily by the political tradition of liberal conservatism. The CDU experienced considerable success gaining support from the time of its creation in Berlin on 26 June 1945 until its first convention on 21 October 1950, at which Chancellor Adenauer was named the first Chairman of the party. In the beginning, it was not clear which party would be favored by the victors of the Second World War, but by the end of the 1940s, the governments of the United States and of Britain began to lean toward the CDU and away from the Social Democratic Party of Germany (SPD). The latter was more nationalist and sought German reunification, even at the expense of concessions to the Soviet Union, depicting Adenauer as an instrument of both the Americans and the Vatican. The Western powers appreciated the CDU's moderation, its economic flexibility and its value as an oppositional force to the Communists, which appealed to European voters at the time. Also, Adenauer was trusted by the British. The party was split over issues of rearmament within the Western alliance and German unification as a neutral state. Adenauer staunchly defended his pro-Western position and outmanoeuvred some of his opponents. He also refused to consider the SPD as a party of the coalition until he felt sure that they shared his anti-Communist position. The principled rejection of a reunification that would alienate Germany from the Western alliance made it harder to attract Protestant voters to the party, as most refugees from the former German territories east of the Oder were of that faith, as were the majority of the inhabitants of East Germany. The CDU was the dominant party for the first two decades following the establishment of West Germany in 1949. Konrad Adenauer remained the party’s leader until 1963, at which point the former minister of economics Ludwig Erhard replaced him. As the Free Democratic Party (FDP) withdrew from the governing coalition in 1966 due to disagreements over fiscal and economic policy, Erhard was forced to resign. Consequently, a grand coalition with the SPD took over government under CDU Chancellor Kurt Georg Kiesinger. The SPD quickly gained popularity and succeeded in forming a social-liberal coalition with the FDP following the 1969 federal election, forcing the CDU out of power for the first time in their history. The CDU continued its role as opposition until 1982, when the FDP’s withdrawal from the coalition with the SPD allowed the CDU to regain power. CDU Chairman Helmut Kohl became the new Chancellor of West Germany and his CDU-FDP coalition was confirmed in the 1983 federal election. Public support for the coalition's work in the process of German reunification was reiterated in the 1990 federal election, in which the CDU-FDP governing coalition experienced a clear victory. After the collapse of the East German government in 1989, Kohl – supported by the governments of the United States, and (reluctantly) by those of France and the United Kingdom – called for German reunification. On 3 October 1990, the German Democratic Republic (GDR) was abolished and its territory annexed by West Germany. The East German CDU merged with its West German counterpart, and elections were held for the reunified country. Although Kohl was re-elected, the party began losing much of its popularity because of an economic recession in the former GDR and increased taxes in the west. The CDU was, however, able to win the 1994 federal election by a narrow margin due to an economic recovery. Helmut Kohl served as chairman until the party's electoral defeat in 1998, when he was succeeded by Wolfgang Schäuble; Schäuble resigned in early 2000 as a result of a party financing scandal and was replaced by Angela Merkel, who remains the leader of the CDU to this day. In the 1998 federal election, the CDU polled 28.4% and the CSU 6.7% of the national vote, which was the lowest result for CDU/CSU since 1949. Thus, a Red-Green coalition under the leadership of Gerhard Schröder took power until 2005. In 2002, the CDU and CSU polled slightly higher – 29.5% and 9.0%, respectively – but still lacked the majority needed for a CDU-FDP coalition government. In 2005 early elections were called after the CDU dealt the governing SPD a major blow, winning more than ten state elections, most of which were landslide victories. The resulting grand coalition between the CDU/CSU and the SPD faced a serious challenge stemming from both parties' demand for the chancellorship. After three weeks of negotiations, however, the two parties reached a deal whereby CDU received the chancellorship while the SPD retained 8 of the 16 seats in the cabinet and a majority of the most prestigious cabinet posts. The coalition deal was approved by both parties at party conferences on November 14. Merkel was confirmed as the first female Chancellor of Germany by the majority of delegates (397 to 217) in the newly assembled Bundestag on 22 November. Although the CDU/CSU lost support in the 2009 federal elections, the FDP experienced the best election cycle in their history, thereby enabling a CDU/CSU-FDP coalition. This marked the first change of coalition partner by a Chancellor in German history. The loss of anti-Communism as a political theme, secularization, and the cultural revolutions occurring since the 1960s have challenged the viability of the CDU. In her 2005 campaign, Angela Merkel was unwilling to express explicitly Christian views, while maintaining that her party had never lost its "concept of values". Merkel and Bundestag President Norbert Lammert have been keen to clarify that CDU references to the "dominant culture" imply "tolerance and living together". According to party analyst Stephan Eisel however, her avoiding the values-issue may have had the opposite effect as she failed to mobilize the party's core constituency. 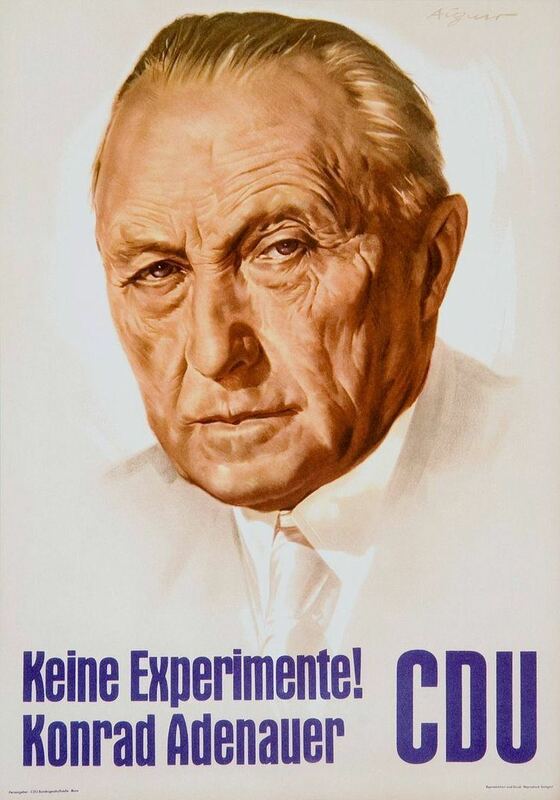 While Adenauer and Erhard co-operated with non-Nazi parties to their right, later the CDU has worked to marginalize its right-wing opposition. The CDU applying the principles of Christian democracy and emphasising the "Christian understanding of humans and their responsibility toward God." CDU membership consists however of people adhering to a variety of religions as well as non-religious individuals. The CDU's policies derive from political Catholicism, Catholic social teaching and political Protestantism, as well as fiscal conservatism and national conservatism. The CDU was the first proponent of the social market economy, although the party has adopted more liberal economic policies since Helmut Kohl's term in office as the Chancellor of Germany (1982–1998). As a conservative party, the CDU supports stronger punishments of crimes and supports involvement on the part of the Bundeswehr in cases of domestic anti-terrorism offensives. In terms of immigrants, the CDU supports initiatives to integrate immigrants through language courses, and aims to further control immigration. Dual citizenship should only be allowed in exceptional cases. The CDU emphasises curtailing red tape and the preservation of cultural traditions. In terms of foreign policy, the CDU commits itself to European integration and a strong relation with the United States. In the European Union, the party opposes the entry of Turkey into the EU, preferring instead a privileged partnership with Turkey. In addition to citing various human rights violations, the CDU also believes that Turkey's unwillingness to recognise Cyprus as an independent, sovereign state contradicts the EU policy that its members must recognise the existence of one another. Opponents of the CDU are the Social Democratic Party of Germany (SPD), The Left party and Alliance '90/The Greens. The CDU has however governed in three federal-level and numerous state-level Grand Coalitions with the SPD as well as in state and local-level coalitions with the Alliance '90/The Greens. The CDU rejects coalitions with either far-left or far-right parties. The Free Democratic Party (FDP), a classical liberal party, is the preferred partner of any CDU government since the CDU and FDP have similar attitudes towards fiscal policy. In May 2012, the CDU had 484,397 members. The number has dropped by 3.1% in 2011 and 3.0% in 2010. The members' average age was 59 years. 6% of the Christian Democrats were under 30 years old. A 2007 study by the Konrad Adenauer Foundation showed that 25.4% of members were female and 74.6% male. Female participation was higher in the former East German states with 29.2% compared to 24.8% in the former West German states. Before 1966, membership totals in CDU organisation were only estimated. The numbers after 1966 are based on the total from 31 December of the previous year. The traditional strongholds of the party are concentrated in rural and Catholic regions such as the Eifel, Münsterland, Sauerland, Fulda district, Emsland, Oldenburger Münsterland, the Thuringia Eichsfeld as well as areas in Nordfriesland, Saxony, Schwaben, Vorpommern, North Saarland, Taunus, and smaller cities such as Baden-Baden, Konstanz, and Pforzheim. There is less support in Bremen, in Brandenburg, and in East Berlin. Both the CDU and the Christian Social Union in Bavaria (CSU) originated after World War II, sharing a concern for the Christian worldview. In the Federal Parliament (Bundestag), the CDU is represented in a common faction with the CSU. This faction is called CDU/CSU or, informally, "the Union;" its basis is a binding agreement known as a Fraktionsvertrag between the two parties. The CDU and CSU share a common youth organisation, the Junge Union. On issues of federal policies the CDU and CSU do not differ, but they remain legally and organisationally separate parties. The social differences between the CDU and the somewhat more socially conservative CSU have sometimes been a source of conflict in the past. The most notable and serious such incident was in 1976, when the CSU under Franz Josef Strauß ended the alliance with the CDU at a party conference in Wildbad Kreuth. This decision was reversed shortly thereafter when the CDU threatened to run candidates against the CSU in Bavaria. The relationship of CDU to the CSU has historic parallels to previous Christian democratic parties in Germany, with the Catholic Centre Party having served as a national Catholic party throughout the German Empire and the Weimar Republic with the Bavarian People's Party functioning as the Bavarian variant. Since its formation, the CSU has been more conservative than the CDU. The CSU and the state of Bavaria decided not to sign the Basic Law for the Federal Republic of Germany, as they insisted on more autonomy for the individual states. The CSU and the free state of Bavaria have a separate police and justice system (distinctive and non-federal), and have actively participated in all political affairs of the German Parliament, the German Government, the German Bundesrat, the parliamentary elections of the German President, the European Parliament, and meetings with Gorbachev in Russia. The Konrad Adenauer Foundation is the think-tank of the CDU. It is named after the first Chancellor of the Federal Republic of Germany and first president of the CDU. The foundation offers political education, conducts scientific fact-finding research for political projects, grants scholarships to gifted individuals, researches the history of Christian democracy, and supports and encourages European unification, international understanding, and development-policy cooperation. Its annual budget amounts to around 120 million Euro. Association of Christian Democratic Students (RCDS), the student organisation of the party.